With the increasing recognition of Aromatherapy, many personal care products are being fused with essential oils. Hair care and Skin Care products are few of those that are widely used nowadays. The fusion of technology and the bliss of nature ensure that the end-user enjoys the benefit that the essential oils provide plus an assurance that both hair and skin are cared for as it should. Before imploring the use of products with essential oils or essential oils plainly, it is crucial to know your own chemistry like the type of skin or hair that you have. Essential oils have specific therapeutic attributes and they must be considered in choosing the best material. With this knowledge, you are able to effectively select the most appropriate elements for your recipe or the best formula to use for yourself. To achieve a moisturized skin all you need to consider is choosing the best carrier oil to mix with the essential oil you desire. After making this combination it is ready for application. Simply massage the treatment on your skin until absorbed and that does it! Note that there are people who have sensitive skin that makes them prone to irritation. The use of hair care or skin care products with essential oils must be selected with carefully otherwise it may lead to allergy. Caution must be practiced for administering these products whether bought from a store or prepared at home. If signs show bad reaction upon application then the use of the product must be discontinued. If uncertain, it is best to try spot test on a small area of skin and observe for any reaction. If the use of perceived treatment does not improve the condition after an anticipated time frame it is best to consult a specialist for other interventions. People with normal skin type may use essential oil types such as lavender, rose and chamomile. Chamomile essential oil is good for normal and sensitive skin. It also works well with skin type that is prone to eczema and acne. It is prescribed to place few drops of this essential oil into an unscented face mask and must be applied s described in the label. Essential oils that are good for Acne are Tea Tree and Cajeput essential oil. A preferred carrier oil to mix with these oils are Grapeseed oil. You can create a toner by adding several drops to rose water. Sandalwood oil is a mild antioxidant that is good in minimizing signs of aging like that of wrinkles and dry skin. Other essential oils that have this property are Frankincense, Neroli, Geranium and Rose essential oil. The use of these essential oils may vary from neat application to adding suggested amount of carrier oil to make a blend. Other than carrier oil you can use lotion which containing lanolin or creams as long as fragrances-free and safe for use on the skin. For skin problem due to excessive exposure to the sun, you may massage chamomile or lavender diluted in carrier oil to the affected area. This facial product has been specifically formulated for deep cleansing of the facial skin. This will allow absorption of the beneficial steam of the herbs to your skin. 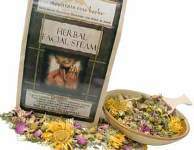 A small amount of this Facial steam may be placed in a bowl of hot water and then drape your head with a clean towel and allow the steam to get to your skin as required. This Skin Cream has the quality of high-absorbency and it does not leave a shiny residue after application just smooth and silky feel and appearance! This cream also will enhance the regenerative capability of the facial or body skin. There is a variance to choose from including Melissa, Cucumber, Rose, Sandalwood, Lavender, Orange Vanilla and even an unscented type. The Wild Rose Facial oil For promoting tissue regeneration and repair of damaged skin like those caused by acne, scars or excessive exposure to the sun. The Classic Rose Facial Oil For preventing wrinkles by rehydrating dry skin and by encouraging the rate of skin tissue regeneration. The combination is best for matured, dry and damaged skin. The Wild Rose Facial Toner For aiding the prevention of acne or oiliness to those who have the skin type that is prone to it. It is recommended that this blend is used with the Wild Rose Facial Oil. This toner will help normalize dry and mature skin. It cannot be helped that at times your skin produces excessive oil and at times it is dry or sometimes it could be just fine. The Rose Face Wash is a blend that is laced with aromatic scent that is good in balancing dry or combination of skin types. This will work perfect on aged skin as well as on skin that is less supple. The Lemon Face Wash is a good blend to use on normal to dry skin. It has the quality to invigorate the skin and deeply clean it as well. This wash is a popular product in Mountain Rose. Additionally tyou may used it as body wash for shower, as an alternative to harsh soaps that dries the skin. This Facial Scrub is perfect in cleansing and exfoliates to reveal a vibrant younger looking skin. This is good for all skin type and is useful in treating oily skin. The scrub allows the removal of deep seated impurities and excess oil. This is double-purpose as well as it can be used as facial mask tool! Just add spring water or other herbal infusion and then apply to the face. Rinse thoroughly after application.